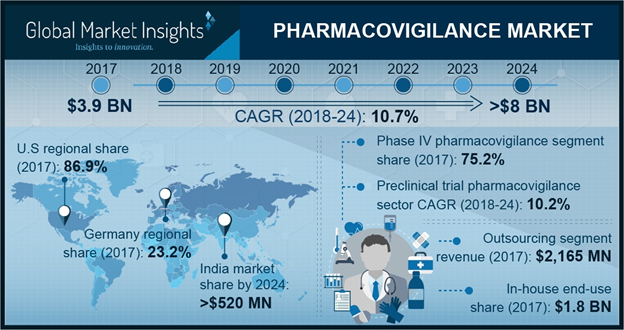 Pharmacovigilance Market size is set to exceed USD 8.0 billion by 2024; according to a new research report by Global Market Insights. Rising rate of adverse drug reactions (ADRs) and drug toxicity leading to increased mortality in developed regions is a major driver for market growth. As per the U.S. Institute of Medicine (IOM), approximately 7,000 people die due to medication errors and ADRs in hospitals and other healthcare settings in the country. This further poses huge cost burden on healthcare systems and fuels demand for pharmacovigilance services. Rising drug consumption due to increasing prevalence of chronic diseases such as cancer, cardiovascular diseases, neurological disorders, diabetes across the globe will drive demand for pharmacovigilance services. Increasing government efforts to bring harmonization in pharmacovigilance practices will positively impact market growth over the coming years. However, lack of adequately skilled and trained healthcare staff coupled with high risk of data security will hamper business growth. Phase IV clinical trial segment dominated the pharmacovigilance market in 2017 followed by Phase III clinical trial segment that is expected to witness 10.8% CAGR over the coming years. Growing need for monitoring drug safety and evaluating drug efficacy based on risk-benefit ratio will drive phase III clinical trial segmental growth. In-house pharmacovigilance segment was valued approximately 1.8 billion in 2017 and will witness considerable growth in the coming years. Increased demand for data security and safety along with presence of companies with skilled staff and developed infrastructure for pharmacovigilance services will favor in-house pharmacovigilance market growth. However, high operational associated with in-house services spurs demand for contract outsourcing services. Germany pharmacovigilance market accounted for 23.2% market share of European pharmacovigilance market in 2017 and is expected to show considerable growth over the coming years. Favorable public and private initiatives conducted in the country such as German Pharmacovigilance Day will propel Germany pharmacovigilance market growth. Such events help in bringing together safety professionals from the healthcare and pharmaceutical domain such as medical devices and biopharmaceutical companies, academic research centers and regulatory authorities. Furthermore, development of good pharmacovigilance practices (GVP) modules and guidelines by the European Medicines Agency will drive Europe pharmacovigilance market growth. India pharmacovigilance market will grow at robust 12.0% CAGR from 2018 to 2024 due to presence of pharmacovigilance centers in the country focused on drug safety management. It is most preferred country for conducting clinical trials owing to cost-effectiveness and presence of large BPOs offering pharmacovigilance services.